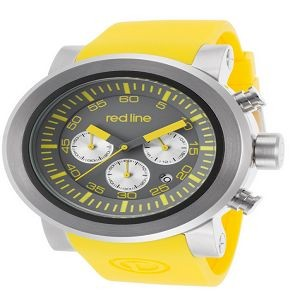 Red Line Torque Sport Watch $54.99. Destined for greatness- the Red Line Torque Sport men's chronograph delivers big impact on the wrist with its robust 50mm diameter case. The stationary bezel with a contrasting bezel ring encircles the highly legible dial with three subdials and luminous hands. Select from models in stainless steel and black ion-plated steel with matching link bracelets or attractive silicone straps. In stock items ship within 24-48 hours.